The following is a reflection by Gerhard O. Forde on Martin Luther’s Heidelberg Disputation, and what it looks like to be a theologian of the cross versus a theologian of glory (and then I follow with my own reflection). So the problem is not that we are not ‘good’, when our standard is the praise of men; instead our problem is that when we stand before Christ, and His goodness, we are truly seen for what we are, not good (the problem is one of the ‘heart’, the ‘invisible’). Thus we ought to follow Christ, to where He took us, the cross. This is the only cure for our self-loving, self-adulating selves . . . death (and of course resurrection, and ascension). This talk also has much to say, implicitly, about the incarnation, which maybe I will broach with my next post. I’m running long . . .
Let us in on who your favorite theologian is. If you had to pick just one who would that be? From any era of the church [from Patristics through Modern day—excluding the Apostles]. And don’t just say who [you can if you want], but give a little reason, why. For me this is easy! 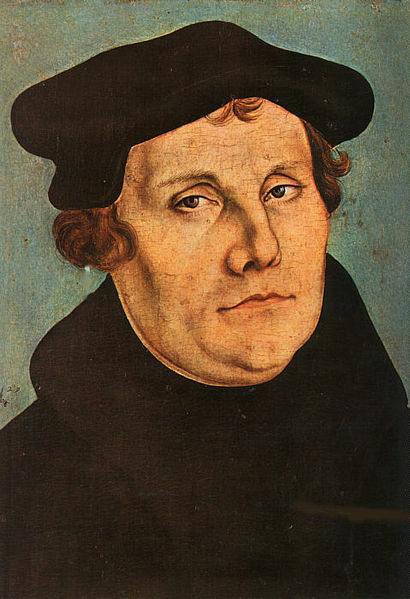 Hands down, it is Martin Luther!! I was first introduced to him, for real, in seminary; in my Reformation theology class. Up until this time, all the way through my bible college under-grad experience, I had always struggled with theology versus biblical studies. Before I ever got to college the LORD had brought some very trying things into my life, including a deep struggle with doubt (God’s existence), resulting in some very deep angst and depression, and some other not so fun issues. As a result of this I began walking with the LORD in a refreshed way; and one thing that I committed to was reading through the scriptures until the LORD returns (which by His grace I am still doing, about twice a year, and multiple times through the NT a year). I digress, once I got to bible college I started seriously reading systematic theology, and apologetics, and quickly became disillusioned. I would walk away from reading my bible, and then go and read these “systematicians,” and leave with a sense of dissonance—it didn’t seem these “theologians” were capturing or communicating the same God that was disclosing Himself to me in the scriptures. In walks Luther. His theologia crucis (theology of the cross) captured the kind of God I had been reading about, for so long (at that point) in the scriptures. I was introduced to the same God who had met me, so often, and so profoundly, in many of those dark nights of the soul (I spoke of earlier). Here was a theological framework that explained all of these other theologian’s approaches—the ones who caused me cognitive dissonance (Luther called this approach theologia gloria, theology of glory). Luther understood the Apostle Paul’s “theology of the cross;” and this is what so deeply resonated with me, and has now provided a trajectory for me that I am still traveling down. So there is my favorite, now who is yours? You don’t have to go into that much detail, but just give us (the readers and me) one . . . don’t be shy, they don’t have to be a big name (often times it is not the big name who has made the greatest impact). I look forward to hearing who you admire most! !